Well, it's time to take a deeper look at Reds 1st round draft pick Yonder Alonso. Alonso stands 6-2, weighs 215, bats left, and throws right. He was drafted by the Minnesota Twins in the 16th round of the 2005 draft by the Minnesota Twins. 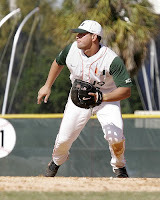 Yonder elected to attend the University of Miami instead and that decision paid off handsomely, as the Reds selected him with the 7th overall pick this past June as a draft eligible junior. Alonso had a truly stellar collegiate career. 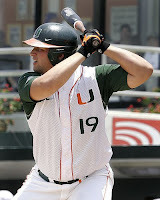 In 2006, Yonder was 19-years old and posted a .295/.373/.492/.865 line as a freshman. He managed to hit 10 homers and demonstrated the polished plate approach that belies his age by posting a K/BB ratio of 37/32. His performance as a freshman was very strong and indicated that big things were to come. He wouldn't make us wait long to see them. In 2007, Yonder took a big step forward and posted a line of .376/.519/.705/1.124 as a 20-year old sophomore. His walks (64) rapidly outpaced his strikeouts (31) and his homerun total jumped to 18. In 2008, Yonder was even better at the plate, putting together a wonderfully absurd line of .370/.534/.777/1.311. His K/BB ratio got even stronger, posting a 35/76 ratio. Yonder was so disciplined that he led the nation in walks (76) and walks per game (1.19). He also finished 6th in the nation with 24 homeruns. He truly was one of the elite hitters in all of collegiate baseball and certainly the most disciplined and polished. When he finally decides to sign, he should move very quickly through the Reds system. Alonso is a large individual with an odd body type. He's very thick and barrel chested, but doesn't seem to be at all out-of-shape or overweight. He's just big and slow. However, while he has below average speed, he actually does seems to have pretty good agility. In addition, he has a pretty good arm and should be able to handle most balls that he can reach. Unfortunately, Alonso is only an average defensive first baseman and his skillset precludes a move up the defensive spectrum to a more challenging position. The problem is that he is likely to get worse as he ages and his body continues to fill out. His body type and skill set don't leave much margin for error on defense, so if he loses any agility or foot speed, then he'll immediately become a DH in a non-DH league. When you start out at the bottom of the defensive spectrum, there isn't anywhere to go but DH. In addition, when you draft someone from the bottom of the spectrum, you are drafting him for his bat. Thankfully, Yonder brings a great deal to the table offensively. Yonder is patient. Very patient. He waits for pitches he likes and makes sure that he doesn't miss them when he gets them. His pitch recognition is obviously very strong, as indicated by his remarkably strong K/BB ratio. At the plate, Yonder utilizes a fairly quiet stance. He doesn't have much excess movement while waiting for the pitch. While the stance matters far less than the position one is in when the pitch enters the hitting zone, I always prefer a quiet approach. Yonder is another player who utilizes a very small stride. His stance is wider than shoulder width, so his stride is really just picking the foot up and putting it back down. However, while his stride foot doesn't move towards the pitcher, it does move in towards home plate. 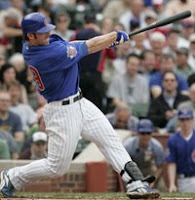 Yonder uses a slightly open stance, so he uses his stride to close his body up and get into better hitting position. His swing generates significant power, but interestingly enough that power is much more evident to center and left field (his opposite field). Eventually, the Reds should be able to help him turn on the ball a bit better, but for now he is more comfortable driving the ball to the opposite field. In his stance, Yonder holds his hands a bit higher than most. While waiting for the pitch, Yonder holds his hands up behind his left ear. This hand position results in the bat being essential horizontal to the ground, rather than pointing to the sky like most hitters. Yonder's stride towards homeplate to close up his open stance when coupled with his higher hand position makes him more comfortable driving pitches that are middle away. When a hitter steps into a pitch, it is often times possible for a pitcher to work successful in on the hands. His hand position adds a bit of length to his swing, as he has to bring the hands and bat up into a better hitting position, which makes him a bit slower to the inside pitches. Given his offensive abilities, it shouldn't be too difficult for the Reds to shorten his swing path to the inside pitches, which will help unlock his pull power. Regardless, his bat speed and slight uppercut swing generate substantial power. Overall, Yonder's combination of power and patience was essentially unrivaled in the 2008 draft. You can access his draft video here. Yonder is a hitter. Period. And, he's a very good one. He brings substantial on base skills to an organization that could use more of them. His combination of power and plate discipline is very impressive. He seems a very good bet to be a complete hitter, posting good power numbers, on base percentages, and high batting averages. That said, he is an interesting choice for the Reds. In the past few years, the Reds have focused on players at the skill defensive positions (CF: Drew Stubbs, C: Devin Mesoraco, etc). So, this is a bit of departure, but also indicates that the Reds may be heading back to a philosophy of drafting the best player available. The Reds already have Joey Votto locked in at first base and, as a college firstbaseman, Yonder should arrive at the MLB level sooner than normal. If a team is going to draft a college first baseman, then they are drafting him for his bat, plain and simple. Accordingly, a polished hitter like Yonder should be in the majors within a year-and-a-half. It would be hard not to be disappointed if he wasn't in the majors by then. Ultimately, Reds fans will love Yonder's offensive game and he adds a much needed impact bat to the system. That said, he's an interesting choice for an organization that already has Joey Votto at first. He would seem to be a better choice for a team like the Royals, who have no first baseman at the MLB level and would benefit from a prospect who could move quickly to join Alex Gordon and Billy Butler before they hit free agency. Ultimately, it's hard not to love Yonder's power and patience, but the surrounding circumstances will have to work themselves out for this choice to have the maximize positive impact on the organization. While he has yet to sign, it's difficult to envision him believing that he could do better by heading back into the draft for 2009. It should be only a matter of time before he is hitting homeruns in the Reds organization. Reds sixth round draft pick Alex Buchholz was off to a white hot start in rookie ball with the Billings Mustangs of the Pioneer League. Buchholz, a middle infielder from the University of Delaware, has posted a stellar line of .366/.453/.610/1.062 with an 18/11 K/BB ratio. Buchholz's bat is his calling card, while his glove lags a bit behind. Still, the former Blue Hen has been fantastic thus far and it's disappointing to see him suffer the injury. Even so, it won't hinder his development in any appreciable way. 2B Alex Buchholz is out three to four weeks after getting hit in the left hand during Friday night’s 14-7 win over the Ogden Raptors. Buchholz was told he fractured a bone in his hand — “a boxer’s break” — he said and he’ll have another evluation Monday before the Reds decide if he should stay here in Billings or go to Sarasota, Fla., for his rehab. As for Buchholz, the 6th-round pick from the University of Delaware said this is the first time he’d received a significant injury in his playing career. “This is going to be the longest three to four weeks of my life,” he said. Buchholz was third in the Pioneer League in batting (.366) and he was tied for the team high in RBIs with Tony Brown at 20. The injury means Jose Gualdron will see more time at second base. There was a very ugly incident during the Dayton Dragons game last night. A team wide brawl broke out against the Peoria Chiefs which resulted in a 1 hour and 9 minute delay and 17 ejections. Eventually, the game was resumed after some of the ejections were overturned. Reds GM Walt Jocketty, who was in attendance, and Terry Reynolds, director of player development for the Chiefs, contacted the league President to overturn some of the ejections. Jocketty and Reynolds did not want to risk having pitchers playing in the outfield, which would have been necessary due to the player shortage. "DAYTON — A first-inning four-run rally quickly escalated into a bench-clearing brawl between the Dayton Dragons and Peoria Chiefs tonight at Fifth Third Field that halted play for an hour and 9 minutes. The game was resumed at 8:51 p.m. after the league office in Beloit, Wis., reversed 17 ejections that were handed down following the brawl, which lasted about 10 minutes. Dayton shortstop Zack Cozart had to leave the game after being hit in the head with a pitch and Peoria second baseman Gian Guzman went out with a broken left leg. Trouble may have started in the top of the first when Dayton pitcher Kyle Lotzkar hit the second batter, Nate Samson. That half-inning ended without further incident, but when Cozart came to bat as Dayton's second batter — with a runner on first — he was drilled in the left side of the helmet by a Julio Castillo pitch. Cozart fell to the ground immediately and eventually was helped to the dugout, finished for the evening. Following an out, Brandon Waring then hit a slow roller toward second that Castillo tried to field. Guzman ran up behind him and fell over Castillo, breaking his leg. He had to be removed by stretcher. That loaded the bases and Denis Phipps hit a pop fly half way down the right field line that bounced sideways into the stands for a ground rule double, scoring two runs. Catcher Devin Mesoraco then singled home two more runs. Dayton's next batter, Angel Cabrera, was hit with a pitch, reacting angrily by throwing his bat and batting gloves toward his dugout. When Keltavious Jones, Dayton's next batter, hit a grounder to second, Cabrera slid into second, legs high, to break up the double play. Now Peoria shortstop Nate Samson reacted angrily, gesturing it was too rough a slide. Castillo then threw a pitch close to Brandon Menchaca's head, prompting Dayton manager Donnie Scott to leave the third base coaching box and complain to home plate umpire Tyler Wilson. That prompted interim Peoria manager Carmelo Martinez to join the conversation, which quickly became heated, and when Martinez pushed Scott, the benches emptied. Several fights broke out behind home plate, and Castillo threw a ball that sailed into the stands behind the Dragons' dugout, hitting a fan who had to be taken to a hospital. Menchaca jumped on Castillo and eventually both managers and 15 players — including eight Dragons — were ejected from the game. Those ejected from the Dragons were starting outfielders Justin Reed and Phipps, Kevin Feiner (who was taking the place of Cozart), starting catcher Devin Mesoraco and pitchers Henry Arias, Jeremy Horst, Jeff Jeffords and Luis Montano. Peoria lost five starters, including outfielders Brandon Guyer and Cliff Anderson, catcher Mario Mercedes, third baseman Jovan Rosa and Castillo as well as pitchers Steve Vento and Audy Santana. Within 45 minutes after the ejections were announced, they were reversed after the Class A Midwest League office heard what happened from the umpires. The ejections were reversed because the teams did not want pitchers to play the outfield positions, which would have occurred had the ejections stuck. Walt Jocketty, general manager for the Reds, the parent club of the Dragons, and Terry Reynolds, director of player development for the Chiefs, whose parent club is the Chicago Cubs, made that feeling known to league President George Spelius by phone. Jocketty and Reynolds happened to be at the game." I don't know what it is, but to me there has always been an inherent ugliness to fighting in baseball. Admittedly, I like hockey and the occasional hockey fight and also enjoy watching the sweet science, but something makes baseball brawls uglier and scarier than these other types of sporting violence. Maybe it's because hockey and boxing always involves willing combatants and take place under the watchful eyes of the referees, whereas that isn't the case in baseball. Or, maybe it's that fighting is to be expected in hockey and boxing and as a result there are strict rules and age old traditions that govern the action. In hockey, fighting is almost always about setting the tone or sticking up for a teammate. The goal isn't to hurt your opponent, but rather send a message. There is a team component and a purpose to fighting in hockey that is absent in baseball. Baseball fights aren't governed by any established rules or traditions and they aren't driven by anything other than a base desire to inflict physical pain and injury on the opposition. 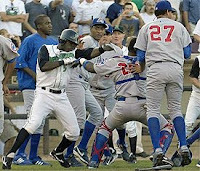 Baseball fights are not part of a sporting event, but rather morph into something else entirely. Something too closely resembling blood lust. Whatever it morphs into typically turns my stomach. Regardless of the reason, I have always found baseball fights to be pretty ugly and unsettling. Hopefully, everyone comes out of the "game" last night in good shape. After watching his performance at the hot corner on Sunday, any remaining shred of confidence I had in his defensive abilities has vanished. Granted, at this point, I didn't have much left, but he is clearly never going to be even a league average third baseman. Against the Mets on Sunday, Edwin made an error that ultimately cost the Reds the game. Edwin threw the ball away in the 10th inning, which led to two unearned runs and a loss for the Reds. Obviously, his poor defense really hurt the team in the 10th, but Edwin also made at least two poor plays earlier in the game that put the Reds behind the eight ball. Neither will show up in the box score, but both were detrimental to their efforts to win the game. In the top of the 2nd, the Mets had Mike Pelfrey at second and Jose Reyes at first. Argenis Reyes grounded to Edwin at third, who made a poor to Phillips at second. Phillips managed to hold the bag for the force out, but any chance at a double play was lost. That brought David Wright up to the plate with two outs and a chance to drive in a run. Edinson ultimately got the out, but it was an opportunity that the Mets likely should not have had. In the top of the 4th, Edinson struck out Mike Pelfrey to get things started. Jose Reyes then stepped up to the plate and lined the ball into the right-center field gap. 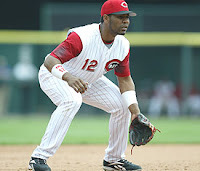 Griffey wasn't quick to the ball, but got it in to Brandon Phillips who made a weak two-hop throw to Edwin at third. Despite the slowness of Griffey in getting to the ball and the weak throw by Phillips, the Reds still had a good chance to nail Reyes at third. Unfortunately, even though the throw was on time, Edwin didn't come up with it and Reyes was safe. Reyes ultimately scored on a sacrifice fly from David Wright, so the poor defense cost the Reds a run. Unfortunately, on this play, there were three weak links in the chain, but Edwin isn't free from blame. If he caught the ball, then Reyes would have been out and the game never would have gone to extra innings. The box score doesn't show all the damage that Edwin causes, but it's more than we might think. At this point, the realization that Edwin is a huge liability with the glove should be dawning on everyone, and yet our front office just labeled him "untouchable." We have been patient in waiting on his development, but he is already 25 and showing no signs of improvement. "Plus/Minus, which represents the number of plays the player made, above/below the number that the average fielder would make, according to the video scouts at Baseball Info Solutions. We rate corner infielders for their handling of bunts, and middle infielders for their work on the double play. We rate outfielders for how often they threw out baserunners (“Kills”) and how often they allowed them to take the extra base. “Rank” shows the player’s ranking in a particular category among qualifying players at his position (usually around 30). Pitchers and catchers are not included." In that spirit, let's take a look at Edwin's performance. In 2006, Edwin posted a -15 in 931.1 innings. In 2007, Edwin posted a -15 in 1168.0. In 2008, Edwin has posted a -12 in only 748.1 innings. It's debatable whether he is getting worse, but at the very least he's not getting any better. In addition, the Plus/Minus system also grades a third baseman's performance on bunts. In 2006 Edwin was ranked 27th, in 2007 he was 19th, and so far in 2008 he is 25th. Including today's error, Edwin has 12 throwing errors on the season and 16 overall. Joe Crede has more errors overall (19), but no third baseman has more throwing errors. It's difficult to understand the impact of a player's defense on a team's W/L performance. So, Dewan provides two rules of thumb for translating the plus/minus stat into runs and then wins/losses. 1) "To estimate runs prevented, use a number that is a little less than half of the plus/minus figure." 2) "The value of a win is at about 10 runs." So, if Edwin is a -15 at third, then that means that he allows ~7 runs, which means that his defense costs the Reds 0.7 more losses than the average third baseman. That doesn't sound so bad, but if you factor in what an elite defensive third baseman would bring to the team, then it looks a bit worse. If you take one of my personal favorites, Brandon Inge, who is an elite defensive third baseman, he was a +27 in 2006 and a +22 in 2007. Just for simplicity sake, let's say he is a +24 third baseman. If you combine Inge's +24 with Edwin's -15, then you get a swing of 39. Using the same two rules of thumb, that is a 19 run difference and a 1.9 difference in wins. Now, Edwin is a better hitter than Inge, but is he 1.9 wins better with the bat? Maybe so, but he gives back much of the gains from his offensive production with his shoddy glove work. If we want to keep Edwin's offense, then we need to move him to a less damaging position, because we just can't succeed with his glove at third. That said, if we do move him down the defensive spectrum, then the value of his production is lower, so it may be wiser to just trade him away for a player who better fits our needs. ***Interesting story about Marty Brennaman needing additional security for the return trip to Wrigley Field. Last time through, Brennaman earned the ire of the Cub fans with the following statement after fans in the bleachers threw baseballs back onto the field following an Adam Dunn homerun: "This is what makes you want to see this Chicago Cubs team lose. The most obnoxious fans in baseball, in this league, are those who follow this team right here." Marty's always classy and objective style earned him so many additional "fans" that he has been assigned a security detail while in Chicago. However, Brennaman didn't seem too worried, simply saying that if "they want a piece of me, they know where they can find me." Yes, we know where to find you, Marty, standing right behind your security detail. ***While this season is quickly becoming another season to forget , there is a glimmer of hope in sight, as the Reds have the potential for a truly dominant bullpen in 2009. The signing of Coco Cordero gave the Reds the shutdown closer they have been lacking and the emergence of Jared Burton gives them a dominant setup man. Those two make for a mighty fine 1-2 punch, but in 2009 it is very likely that Josh Roenicke will be ready to step in and contribute. The three power arms of Cordero, Burton, and Roenicke could give the Reds the best bullpen in the NL, especially when you factor in Billy Bray and maybe Pedro Viola. The troika of Cordero, Burton, and Roenicke could give the Reds the nastiest bullpen they have had since the Nasty Boys roamed the earth. ***The NL Central has gotten a lot tougher over the past few days, as an arms race has broken out. The Brewers pulled the trigger on a trade to acquire C.C. Sabathia and the Cubs responded by trading for Rich Harden. Sabathia earned his first win tonight for the BrewCrew, but may end up being nothing more than a half-season rental for the Brewers, who have clearly made the decision to go for it. Interestingly enough, one of the players who the A's got in return was Matt Murton, who is a player that interests me a great deal. Murton is solid offensive player and a tremendous defensive outfielder. The A's have had a great deal of success despite a tremendous amount of player turnover, which is attributable in no small part to their consistently strong defense. Back in the days of Moneyball, the A's consisted of a team of ice wagons, but lately they have focused on fielding great defensive ballclubs and it has paid off. Murton seems like a player who is very likely to continue that trend, as he is an elite defensive leftfielder. I would have loved to see what Murton could do for the Reds as part of a new 2009 outfield, but hopefully he'll get a chance to shine in Oakland. While it is regrettable that the Reds couldn't reel in Matt Murton, at the very least, it's nice to see the National League acquire two of the American League's elite starting pitchers. ***It will be interesting to see how having two elite arms off the trade market affects the Reds' ability to trade Bronson Arroyo. It may be a tough sell, as Arroyo has struggled and is set to become more expensive in 2009, but the supply is already dwindling which can only help the Reds. The Phillies are rumored to be interested, so maybe we can take Jayson Werth off of their hands. ***It's odd to see three of the NL's best sluggers so slow out of the gate. Prince Fielder, Ryan Howard, and Adam Dunn have all had their difficulties in the early going, but all three have too much talent to be down for long. ***While I remain very skeptical about Jerry Hairston Jr.'s reemergence, it's difficult to ignore his stellar line drive percentage of 31.5%. That is truly an astounding clip and while it isn't likely to be sustainable, if he can keep it a couple of ticks above 20% then he may well be worth a look in 2009. Still, I have serious questions about JHJ. You really don't need to look much past his home/road splits to see why. At home, JHJ has a line of .448/.495/.644/1.138, while on the road he has a line of .232/.273/.305/.578. It looks like JHJ is just the most recent in a long line of veterans (i.e. Joe Randa, Rich Aurilia, David Ross, etc) to find a brief resurgence in the Great American Ballpark Fountain of Youth. Still, he's a rather poor bet for 2009. ***The word from the grapevine is that first round draft pick Yonder Alonso is going to be a tough sign. There are rumors floating around that he is asking for a signing bonus in the neighborhood of $8M. However, if true, it's clear that he needs a big bite of a reality sandwich. The #1 pick Tim Beckham reportedly signed with the Tampa Bay Rays for only $6.15M and #12 overall pick Jemile Weeks just signed for $1.91M. It's difficult to imagine that the #7 pick warrants an $8M signing bonus, given the market has been established. Yonder has a bit of leverage in that he is a college junior, so he could conceivably return to Miami for his senior year, but it's unlikely that he'll choose to do so. The 2009 draft class is deeper, so the odds of Yonder being drafted higher than #7 are unlikely, so by returning to college he risks not only injury, but also sliding down the draft and getting less money for a signing bonus. The smart money says that Yonder will be signed before the August 15th deadline. 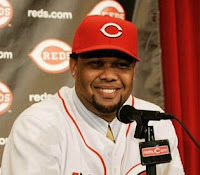 If not, then the Reds will get the 8th pick in the 2009 draft as compensation. The Source of Harang's Struggles? Well, it was another surprisingly ineffective performance for Reds' workhorse starter Aaron Harang. Harang is usually Mr. Dependable. "Steady like a train, sharp like a razor." Unfortunately, that just hasn't been the case this season. Harang continued his lackluster performance in his start against the Chicago Cubs tonight. Harang toed the slab in Wrigley Field, but didn't find the confines to be so friendly. The Cubs touched up Harang for 6 earned runs in 4.1 innings, which brought Harang's ERA up to a disturbing 4.76. Perhaps even more disturbing are the 7 walks allowed by Harang, who is usually very stingy with the free passes. Clearly, something isn't right with Harang, but what could it be? In 2007, Harang was his usual successful self. He posted a 3.73 ERA, 1.14 WHIP, 2.0 BB/9, and an 8.5 K/9. So, in 2008, he is throwing more fastballs and sliders. He has become even more of a two pitch pitcher, which can't be helping his cause. In addition, his fastball and slider velocity are both down a tick. Unfortunately, Harang is also getting fewer groundballs, as his GB/FB ratio has dropped from 1.00 in 2007 to 0.77 in 2008. The Cause of it all: The Relief Stint? While it may be difficult to pinpoint exactly WHY Harang has struggled, it's fairly obvious WHEN his struggles started. On May 25th, the Reds were in San Diego. The game ultimately went a full 18 innings, meaning the Reds played the equivalent of two full baseball games. In that game, the Reds used 10 pitchers. Starter Matt Belisle worked only 4.1 innings pitched and Aaron Harang was the 9th pitcher to enter the game and worked 4.0 innings on two days rest. In the game, Harang was very effective. He struck out 9 batters and allowed only 1 walk and 2 hits. While the encroaching shadows created by the late afternoon sun undoubtedly help, Harang was effective enough to work almost as many innings as the Reds' starting pitcher. Harang's heroics extended the game, but it was all for nothing as the Reds ultimately lost in the 18th inning. While Harang was tremendous that day, it's clear that he hasn't been the same since. Prior to the May 25th game, Harang had an ERA of 3.50 and had made 11 starts. In those 11 starts, Harang had allowed 3 runs or fewer 8 times. In those 11 starts, he had pitched 6.0 innings or more 10 times. After the May 25th relief appearance on short rest, Harang has made 8 starts and now has an ERA of 4.76. In those 8 starts, Harang has allowed 3 runs or fewer only 3 times. In those 11 starts, he pitched 6.0 innings or more only 3 times. Just How Bad Has Harang Been? In the 44.1 innings he has pitched since his ill-fated relief stint, Harang has allowed 36 earned runs!!! That makes for a whopping 7.31 ERA!!! The Reds one time ace has clearly fallen on hard times and it's not difficult to fathom what needs to happen. The Reds either need to adjust the rotation before and after the All-Star break to ensure that Harang gets the maximum amount of rest possible between starts. Or, they simply need to place him on the DL to give him time to recover and re-energize. If the Reds are going to be competitive any time soon, they'll need a healthy and effective Aaron Harang, so they need to do right by him now. This season is clearly slipping away, but having a healthy Harang would help the Reds on the field and help the fans maintain their sanity in what is looking like yet another lost season.